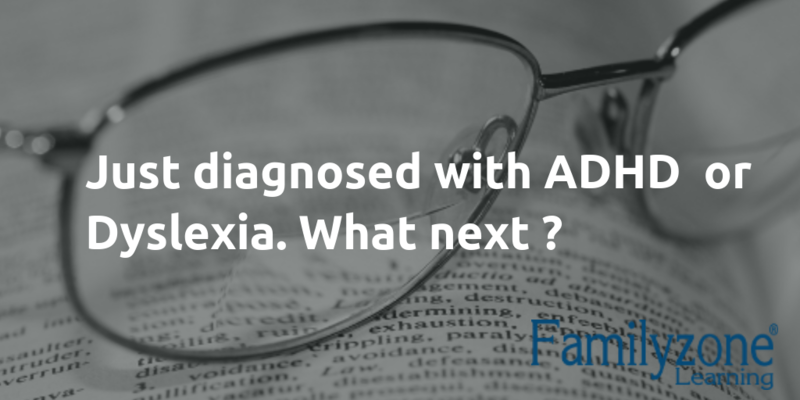 Diagnosed with ADHD or Dyslexia ... Now what ? Diagnosed with ADHD Dyslexia … Now what ? It would seem that about 5% of the children in the world is diagnosed with ADHD. This is in line with South Africa where it is estimated that between 4% and 5% of children is diagnosed with ADHD or ADD. For dyslexia you see statistics that say anything from 15% to 20% of children are affected. The question is then how should you as parent respond when your child is diagnosed with ADD, ADHD or dyslexia? This is a difficult question especially when one considers the small amount of support available to a South African parent compared to those from other countries. A long road of ups and downs lay ahead. On the one hand you may feel relieved because you know the reason why your child struggles at school. On the other hand you may have no idea on what to do next. You may also have to take time to process that fact that the child you know and love does have a learning disorder. Familyzone Learning has compiled this list with some suggestions on how to go ahead in no particular order. You must read as much as you can about the condition your child has been diagnosed with. This will prepare you for any jargon or complicated phrases that you may encounter. Being an informed parent will also help protect you from illegitimate doctors, healers, therapists or persons presenting a solution. For ADHD you need to find out about the medication that is used. What is good about the medication and what are the side effects. You need to investigate how diet influences the condition. For dyslexia you need to know how your child thinks and perceives the world. Read a little on the history of each condition. Search the Internet to find out the Why, What and How of each condition. Remember to carefully consider each source of information for accuracy. The more you read the faster you will be able to separate the good sources from the bad ones. Do not forget to search for support groups on Website forums or social media sites like Facebook where you can engage with other parents or ask questions. With ADHD in South Africa the process of diagnosis is often as follows. A teacher will make an initial diagnosis and tell the parent. The parent then goes to the GP who confirms the diagnosis and prescribes medication. The problem with this scenario is that at no time did any psychiatrist, psychologist, or doctor specializing in neurology evaluate the child. We strongly recommend that parents get a second opinion from a specialists when ADD or dyslexia is suspected. If you can afford to get a third opinion it is highly recommended to see a specialist. Also be careful of the person making the diagnosis especially if the person combines diagnosis with treatment plans. Ideally the person providing the treatment will not be involved with the diagnosis to make sure no bias is present. For example although Ronita from Familyzone Learning is fully capable of testing for dyslexia she prefers her diagnosis to be a secondary or second opinion. The reason is because she also provides dyslexia therapy. If at any time a person tries to discourage you from getting a second opinion on their diagnosis you should be very suspicious of the motives involved. You may find that many people and institutions start to recommend the remedial program you should follow. The teacher may suggest one program while the person who tested your child suggests another program. In the specific case of ADHD you also need to consider if you are going to follow a medication only route or mix medication with therapy or use only therapy. Before you jump into the first suggested therapy program or suggested solution stop and consider your options. Consider what needs to be done and do your research. Do not just blindly go with the fist thing you find. Trust your instincts and talk with your child. Your child is ultimately the one that may or may not benefit. It may be that your child’s teacher was the one who recommended testing for ADHD or dyslexia. Your child’s teacher will be with him or her for most of the day. It is important to form a relationship with your child’s teacher. Having this relationship of mutual understanding and corporation will keep you in the loop on your child’s progress and the effect that any remedial program is having. The teacher can also provide valuable information on how your child learns and interacts with others. In South Africa classes are often larger then they should be and teachers do often not have an easy time. Keep this in mind when interacting with your child’s teachers. Also remember that your child’s learning disability is not a result of the way they were taught or has anything to do with the way the teacher treated him or her in the past. Teachers like to see their students succeed and if approached and treated correctly they are likely to become your biggest ally. Do not run from pillar to post looking for some magical quick fix. Set goals on what you think you and your child need to achieve. Do not leave your child out of this process as they are the ones directly influenced by these goals. If you start remedial therapy clearly formulate what you expect to be achieved. Review these goals with your child and the person doing the therapy to ensure everyone is on the same page. Continuously review and reassess your goals to make sure you are still on the desired path as things change often. Do not forget to talk to your child. Let them also have a say as this will allow them to take responsibility for their own learning. Are you a parent with a child struggling with ADHD or Dyslexia? Or have you gone through the process before? If the answer is yes, you probably have some suggestions and advice for a parent who’s child has just been diagnosed. Please share with the community in the comment section below. Although dyslexia specific watch how Sara Kramer explains how she reacted to her child being diagnosed with dyslexia. And her eventual discovery of the Davis Dyslexia Correction® program. With my medical practice dedicated to ADHD/ADD for 50 years I feel very strongly what I have to say has stood the test of time. An exert medical man needs no psychologist or other to give advice re diagnosis and treatment including remediation and medication. Most important medication must be monitored on a monthly basis to achieve optimal doses using accurate rating scales. Parent and teacher advice is vital. Child motivation is equally important. There is much toooooo much misinformation bandied about regarding this medical inherited neurological condition. World experts have warned re misinformation. Dear Billy your comment does not make sense. On the one hand you say “An exert medical man needs no psychologist or other to give advice re diagnosis and treatment ” and on the other hand “Parent and teacher advice is vital.” It seems to me that you are saying parents should not consult other expert opinions because you know everything regarding ADHD/ADD. I strongly disagree. I encourage all parents to get more than one medical opinion. Far too often you would see that medical doctors like yourself prescribe ADHD/ADD medication without investigating underlying psychological and environmental issues (example anxiety). The fact that you have to mention your 50 years experience does not impress me but rather makes me doubtful that you would ever consider any other treatment than medication.